It Almost Doesn’t Look Disgusting (293/365 year 3) – Annoyingly Boring? I am seldom without a ball cap (when I am able to wear one). This is my go to guy. It’s pretty nasty. Should probably wash it. But hats never come out of the wash quite the same no matter what you do. Had I focused on the bill rather than the logo you’d see how gross it really is. 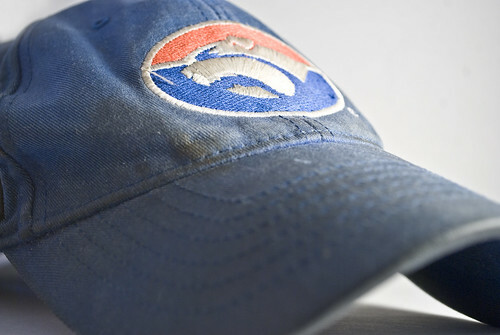 There is nothing like a good hat that needs the oil changed. It looks to me like that one is just getting to the good point. It won’t go bad until the seems start coming out of the bill. Keep it going! I’m always wearing a cap, mostly to cover up my self-inflicted haircuts. In the winter, it keeps my head warm. In the summer, it shields my light-sensitive eyes. Baseball caps just make sense. I put mine through the dishwasher every now and then. They get clean, but don’t get all mushed up as they do in the washing machine. Put it in front of a fan for a few hours afterward, and it looks almost new.